SOUK is a major street food festival happening at Just For Laughs. 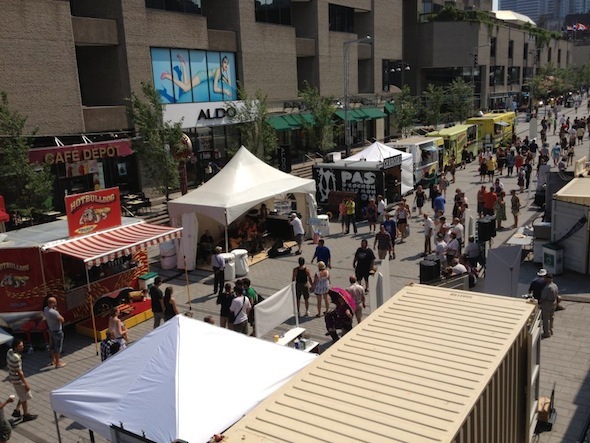 Organized by Ga�lle Cerf of Grumman '78 (rockstars of the Montreal street food movement), expect several food trucks and food stands lined up on Sainte-Catherine, between Saint-Urbain and Jeanne-Mance, from 12:00pm to 11:00pm, every day until July 28th. For a list of all participating vendors, click here. Check out the damage I did, with more to come - I promise! Last summer, Grumman '78 skyrocketed to fame, its overwhelming success a play on Montreal's lack of street food. If you have no idea what I'm talking about, I might have to slap you across the face with one of their not-Mexican-but-Mexican-inspired tacos and throw you under the truck it came from. But as the sunny days faded, so did the Grumman '78 craze. Yes, they appeared at a few winter events and held the occasional taco party at headquarters, but frankly, they dropped from my radar when the season put a strain on chowing down tacos street side. But now, there's no need to wait on the weather. Or chase after the truck for that matter. Grumman '78 recently opened a permanent stand in the food court of the Faubourg. That means tacos all year round, at functioning hours of the day, in one very convenient location. I take Indian food very, very seriously. And when a craving hits, it only makes sense to go to the motherland: Parc-Ex. I've been a long-time fan of Bombay Mahal, host of my first true experience, but I like to keep my options open. Chand Palace, formerly known as Curry & Naan, is actually right across the street and has proven to be a reliable spot to get it on. It's tiny, but good things really do come in small packages. I count my blessings every day for being able to indulge in anything without worrying about gluten, dairy and nuts. I realize not everyone is as fortunate and I can't help but feel that some of you are missing out. But for those of you with these specific restrictions, I assure you this isn't a pity party. In fact, I recently stumbled on a humble bakery in the Mile End that promises not to leave you behind. 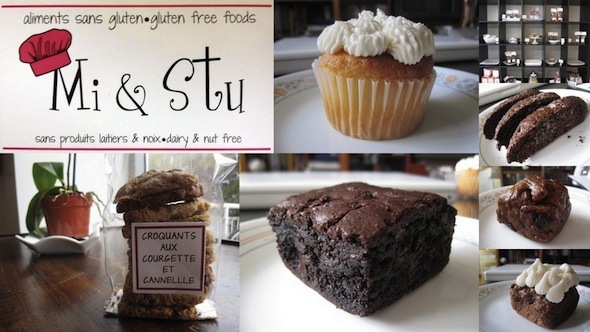 Mi & Stu is brought to us by Mimi and Stephanie, a dynamic duo strictly devoted to baking sweets and breads that are free of gluten, dairy AND nuts. A triple threat if you will. But get this, those of us who can eat everything can definitely get a satisfying kick out of it too. None of the richness and flavours we look for in baked goods are lost in the making, and that's...impressive.